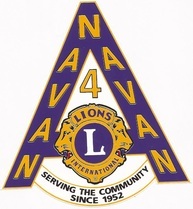 The Navan Lions Club is a group of service-minded men and women dedicated to making our community a better place to live through fundraising and direct involvement with local, regional and global charitable initiatives. The Lions Clubs International Organisation has worldwide membership of over 1.35 million in 207 countries, is strictly non-political and has made assistance to the visually impaired a particular highlight for our efforts. In the Navan community we have served in many ways since 1952. For instance, in 1965 Lions contributed $5,000 to the Agricultural Society for the purchase of the fairgrounds and later over $20,000 to the curling club building. Currently we contribute approximately $30,000 each year to a wide range of worthy causes, balancing local needs with national and international programs and beneficiaries. We always try to help financially or with other support in family emergencies such as a fire or medical situations. We are especially sympathetic to palliative care and home support organisations such as the Hospice at May Court and the Outcare Foundation. We have also been a strong supporter of the Community Resource Centre, which provides the local food bank and other community services. For our vision screening program we visit local schools and use a variety of tests to find those children who would benefit from the professional help of an opthamologist. We support a number of camps for children with special needs and also the Ottawa Children's Treatment Centre. Locally we fund bursaries such as the Herb Deavy award to support local students and the Hida Edwards award to promote musical excellence. We are also the sponsor for a foster child, currently sponsoring an 11-year-old boy in Vietnam. The Dog Guides program is an International Lions Club program to train dogs to help people with various kinds of disabilities - not just blindness, but also hearing impairment and seizures and other disabilities. Click Here for more on our recent activities, as reported in the NAVAN NUGGET. Drop in to one of our meetings or contact us by email. Our Membership Chairperson would love to hear from you!